Free Printable Photo Cards for Friends and Family! Holiday greeting cards are a perfect way to reach out to loved ones this seasons. Enjoy our customizable free Holiday Photo Greeting Cards. You get to personalize the card yourself. Use quality paper and your home printer to make your own photo greeting cards. 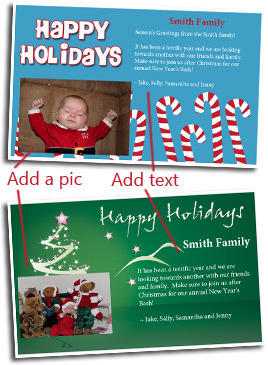 Update the titles, text message and add an optional photo to your Holiday Greeting Card. Enjoy a variety of colors for each style of photo greeting cards as seen below. Select the free printable/customizable holiday greeting of your choice. You can personalize these cards in Adobe just like you would any document in Microsoft Word. Make the updates to the blank Holiday greeting cards as shown in the diagram at the top of this page. Adding a photo is optional. There is text that guides you where to click in order to place the picture (don't worry, if you don't add a picture the guide text won't print). When completed, print several copies of your personalized Holiday Greeting Cards as you will not be able to save your changes unless you have the professional version of Adobe Acrobat.